The fast evolution of surface treatments for biomedical implants and the concern with their contact with cells and microorganisms at early phases of bone healing has boosted the development of surface topographies presenting drug delivery potential for, among other features, bacterial growth inhibition without impairing cell adhesion. A diverse set of metal ions and nanoparticles (NPs) present antibacterial properties of their own, which can be applied to improve the implant local response to contamination. Considering the promising combination of nanostructured surfaces with antibacterial materials, this critical review describes a variety of antibacterial effects attributed to specific metals, ions and their combinations. Also, it explains the TiO2 nanotubes (TNTs) surface creation, in which the possibility of aggregation of an active drug delivery system is applicable. Also, we discuss the pertinent literature related to the state of the art of drug incorporation of NPs with antibacterial properties inside TNTs, along with the promising future perspectives of in situ drug delivery systems aggregated to biomedical implants. Biomedical implants have their most critical moment of integration to living tissues when their biomaterial first contacts the human cells and local microorganisms (Yue et al. 2015). 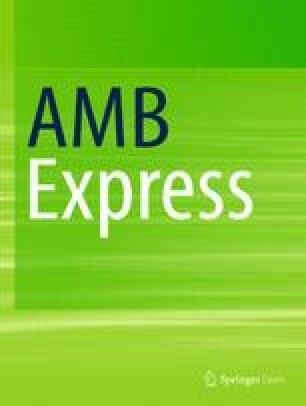 Researchers and clinicians expect the best biomaterial performance during this first contact, and enhance it by changing surface properties and morphology to boost the speed and quality of the healing process (Kunrath and Hubler 2018). However, implant surface contamination by bacterial agents might pose a significant threat, jeopardizing implant healing and/or affecting significantly its long-term survival (Sridhar et al. 2015; Raphel et al. 2016). Nanoscale changes in implant surfaces have been the focus of several currently reported studies. The possibilities involved in surface nanotexturization are diverse, and studies show that these surfaces might offer substantial advantages regarding bacterial adhesion, bacterial proliferation and bone healing (Coelho et al. 2014; Truong et al. 2015; Kunrath and Hubler 2018). Following this idea, a nanotexturization method using electrochemical anodizing allows the formation of TiO2 nanotubes (TNTs), which substantially alter the physico-chemical properties of the implant surface making it friendlier to human bone cells and promoting potential antibacterial properties (Huang et al. 2017; Zhukova et al. 2017). TNTs allow properties changes in terms of surface roughness, energy, wettability, tube diameter and possibly its greatest advantage, the alternative of incorporation of components as antibiotic drugs and other materials with similar potential, along with organic chemicals such as specific proteins, cytokines and growth factors (Hemeg 2017; Awad et al. 2017). The incorporating of such characteristics might allow the concept of a drug delivery system incorporated to those biomedical implants, as numerous drugs might be integrated to the tubes and released in situ through the activation of specific trigger mechanisms, which might be activated for local infection control as needed. (Wang et al. 2017a, b, c; Kunrath et al. 2018). Infections contracted during the surgical act and/or after the healing process represent one of the potential risks to induce failure of a biomedical implant. Therefore, studies have been proposed aiming the development of drug incorporation systems like nanomaterials with antimicrobial properties to minimize those associated risks (Truong et al. 2015). Many ions and metal particles have been described to present antibacterial properties, which can be used in TNTs (Hemeg 2017). Nonetheless, biocompatibility and citotoxicity are features to be carefully evaluated before their safe indication as applicable tools in vivo (Lewinski et al. 2008). Innovative studies are nowadays testing these possibilities regarding drug incorporation with nanomaterials, evaluating their responses against bacterial colonization and cell adhesion (Liu et al. 2016; Yao et al. 2018). In addition, TNTs surfaces allow the development of resorbable coatings over their tubes, which could maintain these added drugs viable, including antibiotics and other potential antibacterial agents, as well as to promote their slow release to the surrounding tissues if needed (Chen et al. 2013a, b; Kumeria et al. 2015). Preliminary studies with biodegradable coatings show promising results of drug release systems up to 30 days after surgical implantation. This might provide the basis for the development of a long-term release system activated by a specific mechanism without favoring bacterial drug resistance (Gulati et al. 2012). The present critical review aims to describe the currently available nanoscale metallic materials with potential antibacterial properties already reported in the literature, detailing the TNTs surface construction process for biomedical implants along with their specific properties that might influence the adhesion and proliferation of microorganisms. In order to do that, the present review illustrates the status quo of nanoparticles/drugs with antibacterial properties incorporated in the TNTs and their preliminary reported test results, including a summary of coating possibilities and alternatives of late drug release mechanisms. 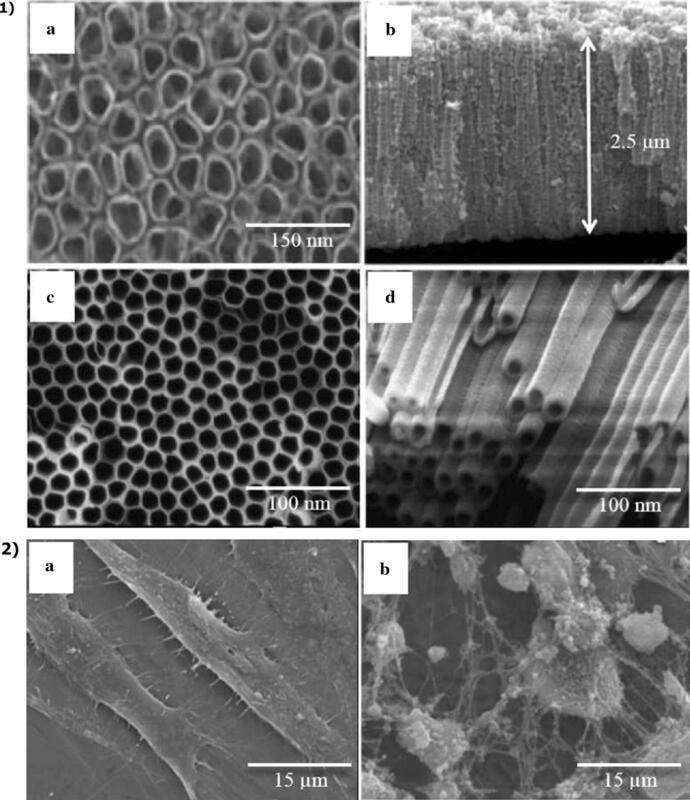 Several materials and natural structures are studied searching for similarities in their intrinsic natural properties that could be adapted and used as biomaterials (Hasan et al. 2013). Some natural tissue surfaces have the ability to inhibit bacterial adhesion and proliferation, as well as alter their surface wettability. Natural-occurring examples are found in plant leaves, skin of aquatic animals, insect wings, among other structures that present antibacterial properties or some effect that might hinders bacterial proliferation (Bhadra et al. 2015; Jaggessar et al. 2017). Currently, implants are produced using synthetic and non-synthetic materials with nanosurfaces, many of them through lithography, laser, or receiving chemical treatments (Zhang et al. 2006; Penha et al. 2018). Due to nanotopographical characteristics, the promotion of cellular interaction is substantial, since the extracellular matrix contact with the prepared surface occurs in nanoscale (Yim et al. 2010). Applied biomaterials are expected to provide faster tissue healing where they are inserted without any generated proinflammatory reactions, including degradation in vivo or corrosion. In addition, they might present properties to mitigate or even inhibit bacterial contamination (Bettinger et al. 2009; Neoh et al. 2012). In this context, many metals have been studied in their natural atomic size, as well as fragmented to a condition of nanoparticles (NP), presenting potential properties (Kim and An 2012; Hemeg 2017). As already known, metals such as Zinc, Silver, Gold, Cobalt, Nickel and Lead have natural antibacterial characteristics, since their interaction with bacteria usually generates cellular structural damages, and complications in bacterial adhesion and proliferation (Dizaj et al. 2014; Hemeg 2017). Therefore, many of these materials, when brought to NPs scale, have their antibacterial properties intensified, since they are able to interact more rapidly and effectively at nanoscale level (Hemeg 2017; Lee et al. 2018). Their main factor related to antibacterial action is associated with the production of hydrogen peroxide, superoxide anions and free hydroxyl radicals that induce countless damages to bacteria, such as membrane disruption, oxidative stress, changes in DNA, interference in the biofilm formation, among others (Oktar et al. 2015; Durán et al. 2016). The electrostatic interaction between the NPs and microorganisms affects its toxicity. Some NPs when connecting to bacterial cell surface release metal ions that bind and disrupt the cell membrane. Likewise, the metal adsorption results in oxidative stress due to ROS generation, which can lead to cell membrane damage. Furthermore, penetration of metal ions across the bacterial membrane results in damages to DNA by interaction with nitrogenous bases, which generate inhibition of DNA replication or lead to DNA degradation. In addition, metal ions can bind to ribosome subunits, inhibiting the protein synthesis (Hajipour et al. 2012; Hemeg 2017; Lee et al. 2018). Another important action of NPs is their interaction with biofilm. Biofilm is formed by microorganisms involved in a self-produced polymeric matrix that mediate the adhesion to a surface, acting as a physical barrier against antimicrobials (Kumar et al. 2017). However, NPs such as TiO2, Ag, ZnO, Cds, MgF2, Bi and YF3 can inhibit bacterial biofilm formation or disrupt formed biofilms (Hemeg 2017). To clarify the antibacterial properties of metals, Table 1 shows the results of studies on different bacterial species and the generated effects in terms of their function and tissues, focusing mainly on the use of NPs derived from base metals. NPs are able to inhibit the adhesion, proliferation and to cause damage both in gram-positive and gram-negative bacteria, but some studies have demonstrated that NPs derived from NiO, Cu, Al2O3, SiO2 and Fe2O3 should be more effective against gram-positive bacterial strains (Baek and An 2011; Ruparelia et al. 2008; Jiang et al. 2009; Azam et al. 2012), suggesting a greater vulnerability of gram-positive bacteria to NPs. However, other studies indicated that Au and ZnO NPs are most effective against gram-negative pathogens, due to the higher thickness of the peptidoglycan layer in gram-positive bacteria (Shamaila et al. 2016; Sinha et al. 2011). In addition, Ruparelia et al. (2008) demonstrated that silver NPs should be more effective against E. coli (gram-negative bacteria) than B. subtilis (gram-positive bacteria). Conversely, Yoon et al. (2007) found a better efficiency of Ag NPs against B. subtilis than E. coli. Therefore, it should be considered that there are many variables among the studies, such as NP size and concentration, and the method used to evaluate the antimicrobial activity. Physical and chemical treatments for Ti have been proposed in order to obtain surfaces with better biocompatibility. Among these techniques, anodization has been recognized for improving wear and corrosion resistance, as well as increasing TiO2 surface roughness and surface porosity, with varying thicknesses (Liu et al. 2012). In addition, it is considered a methodology that easily reproduces results, being accessible and inexpensive, and also able to facilitate researchers to test their properties with different scientific bases (Awad et al. 2017). Surface modification has been reported to be an effective tool to promote the integration between bone and biomaterials (Minagar et al. 2012). Anodizing is an effective electrochemical method that has been used successfully in orthopedic implants surface treatment (Liu et al. 2004). It can be performed in an electrochemical cell with two electrodes (usually titanium anode, platinum or titanium cathode). The oxidation and reduction reactions occur at the anode when a current or constant voltage is applied, thus establishing an electric field that guides ion diffusion present in the electrolyte, leading to oxide film formation on the surface of the anode. The chemical and structural properties of anode oxides vary according to the different solutions used as electrolytes. The anodization electrochemical parameters significantly affect film growth behavior and properties. Such features include the type of solution used as electrolyte, reagent concentration, temperature, electrical parameters, anodizing time and solution stirring speed (Liu et al. 2004; Cui et al. 2009; Liu et al. 2012). The anode potential and the electric current can alter the anion transfer process during anodization, as well as determining thickness, surface morphology and microstructure of the anodic coatings (Awad et al. 2017; Kunrath et al. 2018). From the control of this entire process and selection of the correct protocols, TNTs can be developed with dimensions and properties suitable for biomedical implants as shown in Fig. 1. Small changes in the anodization process directly influence the properties of TNTs, such as surface roughness, wettability, cellular interaction, drug loading capacity and chemical physical structure, as can be seen in Fig. 2 (Awad et al. 2017). Nanotubes surfaces with greater roughness and very low wettability angles have been described to allow expressive responses in adhesion and proliferation of mesenchymal or bone cells (Vasilev et al. 2010; Yu et al. 2018). On the other hand, some investigations have shown TNTs surfaces with hydrophobic properties might positively influence bacterial adhesion (Zhang et al. 2013). Important biological properties associated with implant surfaces are hugely influenced by changes in tube morphological characteristics. A great number of studies applying cell culture techniques on TNTs presented better cell adhesion and proliferation on nanotubes of 70 nm in diameter (Awad et al. 2017; Yu et al. 2018), although expressive results were also reported when applying diameters ranging from 30 to 100 nm (Yu et al. 2018). Antibacterial properties of TNT surfaces were evaluated in comparison with bacterial responses to microtextured surfaces (Miao et al. 2017). As most bacteria and/or viruses have their size compatible to a micrometric scale, the nanoscale topography presented in TNTs seemed to reject or even hinder their growth in culture (Jaggessar et al. 2017; Miao et al. 2017; Lee et al. 2018) Another observed advantage is that TNTs chemical–physical structure presents great resistance to corrosion and degradation in vivo, showing promising results considering application in biomedical implants (Alves et al. 2017). Despite these numerous advantages, the greatest differential of the TNTs technology relies on the possibility of drug or NPs incorporation in the tubes. As described by some authors, this might allow even the creation of a “smart” drug transport system, allowing that a drug could be stored and late released in situ in an on-demand basis, not possible in any other surface treatment currently used in biomedical implants (Wang et al. 2017a, b, c; Awad et al. 2017). One of the most influential properties regarding cell or bacterial adhesion to metallic implants is surface wettability. This property can be modified with consequent treatments of the nanotubes applying thermal, chemical, photofunctionalization, and coating treatments (Oliveira et al. 2017; Hasan et al. 2013; Lai et al. 2016). Studies on hydrophobic surfaces showed important bacterial anti-adhesion properties and promotion of bone cells growth (Lai et al. 2016; Fadeeva et al. 2011; Gittens et al. 2014). These results might be extrapolated for nanotubes surface development aiming the promotion of bacterial repulsion, combined with high biocompatibility as depicted in Fig. 3 (Xu and Siedlecki 2014; Mei et al. 2014). Synthetic and/or non-synthetic coatings, which are used to keep added drugs in the internal parts of the nanotubes, or to protect the TNT system, usually present hydrophobic properties (Oliveira et al. 2017; Kumeria et al. 2015). The adsorption of bacterial extracellular matrix to these surfaces might be impaired, turning bacterial local proliferation and consequently biofilm formation unlikely (Xu and Siedlecki 2014). However, other studies characterized hydrophilic surfaces as presenting better adhesion and proliferation conditions for bone-like and undifferentiated mesenchymal cells, as well as pre-osteoblasts (Lotz et al. 2018; Gittens et al. 2014). This may be a counterpoint compared to hydrophobic surfaces. Nonetheless, as described above, other studies showed better antibacterial performance on hydrophobic surfaces, and this surface wettability vs. bacterial/cell relation is still not fully clarified. Traditional therapies to prevent or treat infection/inflammation in surrounding tissues of biomedical implants are usually administered systemically. However, systemic drug administration does not target a specific site and may not interact directly at the desired site. The possibility of having a localized and selective drug delivery system for biomedical implants acting as an aid or even replace a systemic drug administration becomes extremely promising (Lyndon et al. 2014; Hemeg 2017). It has been stated that regarding implant surgery, osteoblasts and bacteria establish a marked competition for implant surface adhesion, and the alternative of loading TNTs with antibacterial drugs might be of great advantage (Miao et al. 2017). Other studies have also suggested that the successful loading of TNTs with antimicrobial peptides for later local release might positively contribute to raise levels of infection prevention, or the combination of an initial rapid release with an extended slow and gradual release (Li et al. 2017). Investigations suggested that some bacteria such as Staphylococcus aureus, Staphylococcus epidermidis and Escherichia coli are often present in implant postoperative infections and negatively affect the healing process of bone. In order to combat this local cellular competition more emphatically, the alternative of improving surface properties with antibacterial characteristics becomes crucial (Anselme et al. 2010; Widaa et al. 2012). Alternatively to antibacterial drugs, application of specific metal particles might also be considered due to their specific bacteriostatic and bactericidal activities. Metallic elements such as ZnO-NPs presented excellent ability to control S. aureus when applied to TNTs (Yao et al. 2018). In this context, an investigation on loading of ZnO nanoparticles of irregular and regular shapes to the implant surface and later testing it against bacterial proliferation as well as macrophages viability was conducted. The results suggested a ZnO capacity to inhibit bacterial growth and macrophage adhesion, which might ultimately result in lower levels of local inflammation around implants (Yao et al. 2018). Silver nanoparticles loaded onto TNTs showed a significant antibacterial effect against E. coli at both contact kill analysis and agent release killing effect, presenting promising results (Chen et al. 2013a, b). Copper nanocubes (20 nm) were also loaded onto TNTs and showed effective antibacterial action against S. aureus and E. coli, causing eradication of these bacteria in laboratorial cultures (Rosenbaum et al. 2017). In addition to NPs derived from metals, studies showed also the possibility of TNTs loading with commonly used systemic antibiotics, especially those targeting bacterial cell wall and protein synthesis. Investigations have presented in vitro and in vivo results involving TNTs loaded with vancomycin (Zhang et al. 2013). Preliminary data suggested better in vitro antibacterial performance against S. aureus in the groups with nanotubes loaded with antibiotics compared with TNTs-only control group (Zhang et al. 2013), suggesting that the application of antibiotics in situ might be a viable alternative appropriate to this technology. Different outcomes of antibiotic loaded TNTs where verified, and most often antibiotics might generate particularly interesting results. A pioneer study in TNTs antibiotic loading used doses of gentamicin against S. epidermidis in vitro (Popat et al. 2007). Their results showed complete TNTs filling, as well as reduction in bacterial surface adhesion and an increase in the proliferation rate of pre-osteoblasts where the antibiotic was used, revealing a double positive result without interfering with implant biocompatibility (Popat et al. 2007). The most recent studies employing incorporation of drugs, specific agents and NPs as antibacterial agents into TNTs is summarized in Table 2, where their promising results are described, revealing also the “state of the art” of this technology. As the demand of active functionalization of different biomedical implant surfaces rises, the need to investigate how to properly seize/immobilize different types of drugs or NPs on the implant surface escalates. Thus, a series of investigations suggesting the use of ceramic, organic, or inorganic materials as implant coatings are being conducted with the objective of creating a protective stable but resorbable layer that can gradually release the drug once needed (Civantos et al. 2017). The TNTs surfaces offer the possibility of chemical–physical coating adhesion on their surface along with drug incorporation to their tubes. When evaluated in vitro, biodegradable coatings showed excellent results on titanium surfaces, positively influencing their biocompatibility with expressive results of bone cell proliferation and adhesion (Goodman et al. 2013; Oliveira et al. 2017). In addition, progressive coating degradation has been characterized as a viable event that may allow the release of drugs or NPs aiming to potentiate bone healing or even prevent possible microbial infections (Oliveira et al. 2017). Figure 4 shows a schematic of how TNTs with coatings stabilize the drugs in their tubes and materials, which can be used to make these coatings. Furthermore, some studies have even extrapolated the incorporation of drugs or growth factors (GFs) not only to their TNTs but into their coatings as well. Chitosan coatings incorporated with GFs presented better results in terms of cell adhesion, bone cell proliferation and increase in the expression of bone formation markers in vitro (Abarrategi et al. 2007). Also, Chitosan coatings were tested for antibiotic incorporation in vivo presenting promising results as well (Jennings et al. 2015; Lai et al. 2017). The combination of loaded TNTs with a drug-incorporated surface coating might represent an attractive possibility for in loco treatment of a failing and/or compromised implanted device. However, studies investigating this possibility are scarce and, when available, still at early stages, and so far there is no single definition in terms of the best surface coating material or the ideal drug to be implemented for these purposes in vivo. 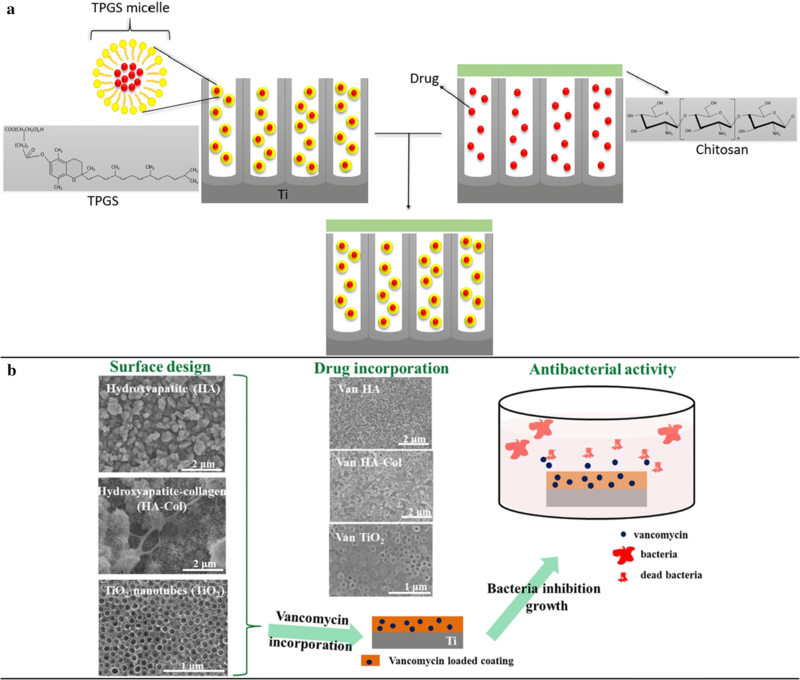 One attempt to investigate the possibilities involving surface coating association with TNTs drug delivery system was related to late local antibiotic-release activation (Wang et al. 2017a, b, c). In this investigation, nanotubes were firstly loaded with antibiotics and then sealed with coordination polymers through a metal ion bond, generating a hybrid system with potential antibacterial properties. Reported in vitro observations revealed that the antibiotic agent was kept inside the tubes until the surrounding environment had its pH altered. As the inflammatory process elicited by bacterial infection has the potential to change the local pH, this in vitro drug release system was activated, suggesting a possibility for long-term local drug maintenance prior to its late release (Wang et al. 2017a, b, c). In conclusion, the present overview critically analyzed the significant diversity of drugs, metals and NPs presenting antibacterial properties and their functionalization on TNTs surfaces, depicting a wide range of these potential metals and drugs used in biomedical implants and related advanced research regarding their biocompatibility and potential antibacterial effects. TiO2 nanotubes surfaces show a large energy area for immobilization and subsequent functionalization of nanoparticles, preserving its biocompatibility and mechanical stability. Many strategies to incorporate NPs and drugs to implant surfaces have been presenting promising preliminary results in combating bacteria that cause infections in the human, and especially where biomedical implants may be placed. It has been suggested by some investigations that the drug delivery system applied to TNTs might be successful and has promising early results. Even though a large part of these reported studies represent in vitro evidence, the pathway for clinical trials involving concepts on the application of drug delivery TNTs has already been suggested, followed by more extensive cytotoxicity tests and in vivo observations to firstly ensure their biologic safety. The possibility of decreasing the application of systemic antibiotics usually associated with side effects to patients for an in situ usage seems to be one of these drug-loaded TNTs most advantageous properties, since their association with surface coatings may keep a drug and/or NP active for a long-term gradual release once needed. Further investigation in vivo should be performed to establish the proper advantages and efficacy linked to the in situ application of antibiotics in biomedical implants compared to systemic drug administration. Finally, the use of functionalized TNTs aiming a localized release of antibiotic drugs and bactericide NPs has presented promising early results and should be further explored aiming future medical applications. The possibilities related to local infection control may positively influence the outcome of a major biomedical problem related to implant loss and/or disfunction. With established protocols regarding adequate drug dose and production optimization, this technology can play an important role into further increase the clinical success of biomedical implants in the near future. MFK, conception/design/creation/acquisition/interpretation/drafted the work. BFL, design/acquisition/interpretation/drafted the work. RH, conception/acquisition/drafted the work. SDO, design/acquisition/interpretation/drafted the work. ERT, conception/interpretation/drafted the work. All authors read and approved the final manuscript. This study was partially supported by the Brazilian National Council of Research and Development (CNPq)—Research Grant Number: 140903/2016-0. SDO is thankful for the Research Career Award of the National Council for Scientific and Technological Development (CNPq).